Several of my Facebook friends have been posting photos about their yester-years. It triggers some nostalgic moments for me. Spurring such a mood is my current phase of unpacking my boxes containing all kinds of stuff that reminds me of the ‘good-old-days.’ Like my friends who have meticulously scanned in their photos of days of old, I too have my share of photos from the ‘good-old-days.’ The worn out colours reveal the era where photography is still considered ‘primitive’ compared to our modern ubiquitous digital technology. 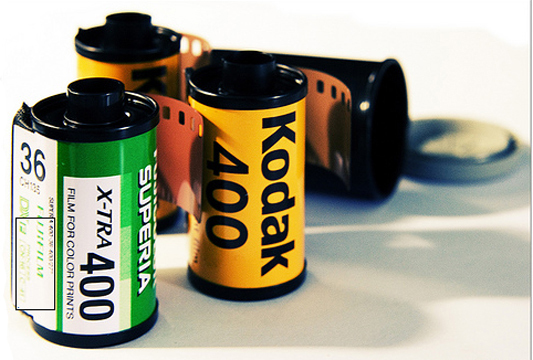 Back then, we buy film rolls that require us to have an understanding of ASA 100/200/400, or a 12/24/36 quantity of photos, or a brand preference like Kodak/FujiFilm/Agfa/Polaroid and so on. Compared to our modern digital gadgets where point and shoot technologies have transformed the commoner into a pretty good photographic amateur, back in those days, one will need to know more about the camera. Now it seems like the camera knows more about us, making ‘photo-taking for dummies’ a common occurrence everywhere. I still have my good old SLR camera that relies on hard to find camera film rolls, depends on troublesome photo development dark rooms. Compared to the almost immediate images we see on our digital camera screens, back then, we need to wait until the last photo has been snapped before we see our masterpiece, or our mistakes. I can still remember one embarrassing mistake I made. Thinking I had 36 shots in my camera, I would offer to take group photos, urged my friends to pose in their prettiest or fabulous best, and click away. Only to realize at the end of the day, I had no film inside my camera! The ‘good old days’ are not exactly good old days for me. Thankfully, modern cameras warn users about missing SD cards, or memory sticks prior to snapping any digital photos. Looking back, I am thankful for the help friends have given me, like David and Lyndon who volunteered graciously to take our wedding photographs, without payment, without fuss, and without any hint that they have been inconvenienced in any way. Such is the power of friendship. Friends give and give, without asking anything in return. As a recipient of their grace, I am encouraged to live forward graciously. I am also reminded of my younger years where there are certain questions I get easily irritated. Let me mention three of them. First, it is "Aren’t You Going Home?" I live on campus during my Undergraduate years. Since the University ground is rather remote, I spend most of my time inside the campus. I sleep. I study. I eat. I swim. I rest there. All day. All week. Many months. When the long holidays come after each semester, many friends will go home. They have their families and big houses. They have their exciting holiday travels. They have their nice good-old-connections to return to. Not for me. My priority is to do some catch-up. After all, I am not that good a student to be able to understand most of the stuff my professors have taught. Unlike some, I need to put in extra hours just to understand basic concepts. After a hectic study term, all I wanted then was to sit back in the quietness of campus and do catch-up at a more manageable pace. Why then are people asking me to ‘go-home’ when I need to do some catch-up? I need time to study, time to revise, and time to relax a little. I suppose what annoys me then is the way the question tries to fit me into a tiny ‘everybody-is-doing-it-and-so-must-you’ cubicle. Looking back, perhaps, I should have simply acknowledged the question as a conversation starter, instead of seeing it as meddling my personal life. - “So when are you getting that lucky girl? - "When are you getting married?" Even my mother, to my dismay, sometimes joins in the prying. Before my degree, I can easily divert that question by stressing that my priority is to graduate. It is after getting my Bachelors, this question takes on a whole new potency. I can easily say, ‘girls want guys with a stable career,’ but excuses only delay not stop the questions from coming. Truth is, the longer I wait, the more such nosy questions will come. I suppose I feel insecure then. I have a degree but no job. I have many friends but no one special girlfriend. I have the questions, but not the answers. Ouch! That question hurts. The third question comes fast and furious after marriage. “When are you two going to have kids?” Following close to this will be “When are you going to have #2? #3? and so on” in quick succession. O brother! When will it all end, I ask myself. Why can’t people leave my personal life alone? The consolation is that the question is not to be carried by me alone. I have my wife to shoulder this burden. I have my job to bury my head under. I have God to divert all questions to. Learning Point: Looking back, I tell myself I should have simply accepted these questions as a recognition of my stage in life. The irritations I feel are but glimpses of my insecurity in life. One of my favourite quotes is from the Danish philosopher, Soren Kierkergaard. There are many things that we cannot understand in the present. Only having lived through it, and as we reflect, we see glimpses of God's Hand at work in some mysterious way. I think about the time I am single. While carefree and independent on one hand, there is that nagging feel that I need to have some emotional settling down, preferably with a nice loving Christian lady. I have no dates throughout my high school or college years. I remain a bachelor, living with bachelors, armed with a measly Bachelors. Going through this period of singleness is tough. I remember reading somewhere in a survey about the happiness index affecting the different sexes. It is ranked as follows, 1 being most happy, 4 the least. "Lord, if it is your will, let me go to the mission field, single or married, as you wish. Doing your will is the safest place for me." A funny thing happens when I yield myself to God. I have that peace. I have that assurance that things will be ok. It is no longer how I see things, but it is how I see things from God's point of view. I learn about the struggles singles face. I learn about being able to focus on God's ministry, with a glimpse from the Apostle Paul's perspective. Learning to let go, and let God remains a precious learning jewel. I learn about prayer. "Prayer is not about telling God, 'My will be done.' It is in confessing to God, 'Thy will be done.'" Prayer is not telling God what to do, but in letting God inform us about what we ought to be doing. We pray not to change God but to change ourselves to learn to see from God's point of view. We look to the past not to get stuck in the past. We remember the past, appreciate the lessons learned, and live forward. In times of trouble, we often complain why present life is tough. We compare our present situation negatively by propping up our past positively. Qoheleth tells us that it is foolish to bring up the past and downplay our present. On the other hand, if we learn well from the past, cherish the present, we put ourselves in good stead toward living forward. Learn well. Live Bold. Think Constructive. Be Grateful. These form the essence of a thankful heart. Let the 'good old days' spur a greater new future. Live forward.